A few years ago a got the book One Hundred Ways For a Horse to Train its Human. 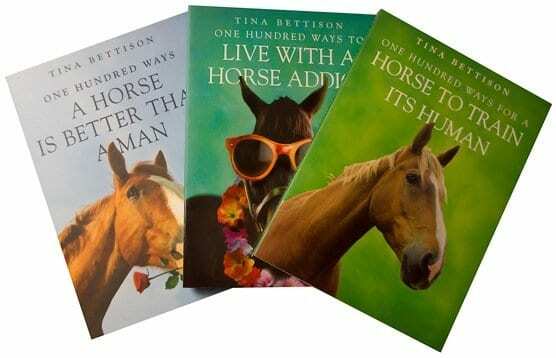 This was a fantastic present and my Sister was obviously paying attention as for my birthday yesterday she got me the other 2 books by Tina Bettison; One Hundred Ways to Live with a Horse Addict and One Hundred ways a Horse is Better than a Man. I love all these books and with Christmas coming up they are perfect stocking fillers for any horsey person, or perhaps your non-horsey partner! They are very well written and really hit home with the truth of being a horsey person! Although they probably aren’t the sort of book for you to sit down and read for a couple of hours. They are the perfect book to have on your desk to read for a few minutes to give you a break and put a smile on your face. Highly recommend!